When a saint descends to earth to observe how his feast is celebrated in Malta, he is shocked and soon finds the rest of the town against him. His only ally is a small boy. Festa tal-Qaddisin is a new social comedy about feasts, with the inclusion of popular band marches that are customarily heard in feasts. In this work the difference between the original aim of feasts and how these have been transformed to suit other purposes is evident. It all starts when Saint Crispin comes to know from someone in heaven how well his feast is celebrated in Malta. This third century saint – who was martyred and venerated as the patron saint of cobblers – told Saint Peter that his wish was that he could descend to enjoy his feast in Malta. Saint Peter was opposed to Saint Crispin’s idea, because he was well aware how Malta’s feasts are not wholesomely religious. Nevertheless, Saint Crispin’s pleas were heard and Saint Peter had to budge – Saint Crispin was to descend to Malta from heaven during the week of his feast. Everything is to Saint Crispin’s heart’s content upon his arrival on earth. The world has changed since his last sojourn in it. In ‘his’ locality, the streets are decorated sumptuously for his feast, and the place could not be more delightful. This heartens Saint Crispin as regardless of what Saint Peter told him, there was nothing to complain about. Saint Crispin is delighted to hear the approaching band marches. He falls instantly in love with the distant music and tries to imagine the praises to God sung to such sweet melodies. But he gets a cold shower when the marching band approaches and he can hear his ‘supporters’ singing unwholesome lyrics towards ‘the other side’, the supporters of Saint Catald. Saint Catald and Saint Crispin are great friends in heaven, and therefore Saint Crispin is displeased with the marches and songs against his best friend. He also notices that brawls are bursting during the marches. How do the locals greet him? Do they accept him in their feast? Do they believe him when he tells them that he is indeed Saint Crispin? Do they let him celebrate with them? And was Saint Peter in disagreeing with Saint Crispin about his visit? These are some of the episodes in Festa tal-Qaddisin, which, together with comic relief and moving scenes, will keep the audience entertained. Festa tal-Qaddisin is written by: Joe Julian Farrugia, directed by Mario Micallef and produced by Teatru Manoel. 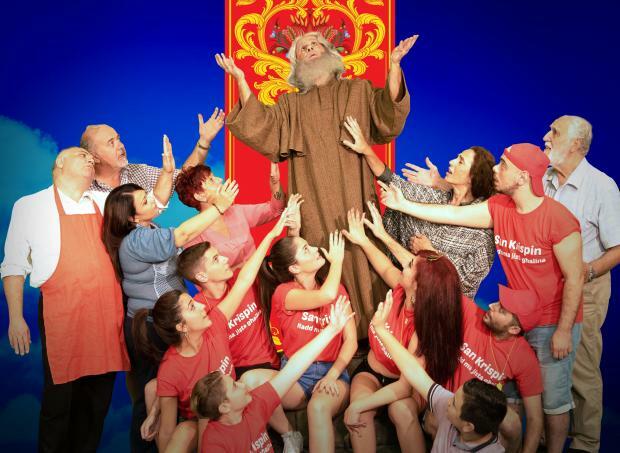 The cast includes well-known actors and new names, including Renato Dimech, Joe Quattromani, Manuel Cassar, Marvic Cordina, Silvio Axisa, Aiken Buhagiar, Jurgen Ciantar, Shelby Aquilina, Claudia Mizzi, Dolan Debattista, Patrick Tanti, Veronica Mizzi, Josette Ellul, Orietta Cardona, Jake Cauchi and others. Festa tal-Qaddisin shows at Teatru Manoel on Friday, November 9, Saturday, November 10 and Sunday, November 11. Tickets can be selected and bought from Teatru Manoel’s website www.teatrumanoel.mt, via e-mail on bookings@teatrumanoel.mt or call on 2124 6389.